Full Brochure and Complete Solutions Guide in PDF Format. Thank you for your interest in our New Solution Guide. Please confirm your details below to access the download link. 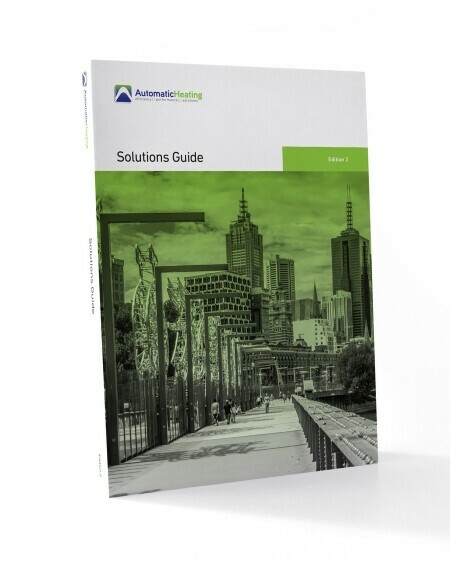 Alternatively, scroll down to view the Solutions Guide online. Links updated to include category page hyperlinks in page headers. This facilities returning to main category page in addition to the existing Contents page link. Edition 2.3 includes product data updates. Edition 2.2 includes updated content as well as links added to products lists in Contents table on page 1. A green ‘Contents’ link has also been added to each page to facilitate returning to the contents page from anywhere in the document. Automatic Heating’s full product and solutions guide is an extensive overview of our complete range. We hold a vast array of equipment and accessories in our warehouse in the northern suburbs of Melbourne, Victoria. We can attend sites in Melbourne within a short time and we are situated near major road links to serve the rest of the country and beyond. Our Solutions Guide is constantly assessed and reviewed to ensure the information it contains is accurate and up to date. Our staff are involved in research and development of the products we supply, so are able to keep a finger on the pulse of the industry and make amendments where necessary. Each product category is reviewed in detail to allow you to make an informed choice about the options available. Detailed technical data is listed on important areas like Dimensions, Specifications, Efficiency and Performance. Installation guides are provided in many cases with schematic diagrams and case studies. Maintenance schedules and instructions are also covered along with recommended settings and setups. The guide will download in convenient PDF format with hyperlinks, so can be accessed in most environments and totals over 300 pages of comprehensive information and product specifications.